Letters supporting this project had already been received from the Worcester and Durham Associations. By November 1910 Charles Dack had received so many encouraging letters that he sent out a second letter intimating that a small provisional committee had been formed, made up of:- Chairman, Arthur Hardgrave (York); Vice Chairman, Edward Laws (Durham); Hon. Secretary, Charles Dack (Peterborough); and Hon. Treasurer, William Calladine (Lincoln). York - A Hardgrave - with other local cathedral ex choristers. So on this delightfully hot day in June, the National Federation was officially formed, with the officers enumerated above unanimously elected, and only nine months after the original idea was discussed in September 1910. Altogether there were sixteen founder Associations affiliated to the new Federation. These are listed below with their Hon. Secretaries. This information was obtained by a former Hon. Secretary of the Federation, Frank Hewitt (Chester) and confirmed by Arthur Grundy (Canterbury) who was, at that time, the only official representative alive who had attended the inaugural meeting at Peterborough. The first Festival was held in York in 1912, to be followed by a second in Rochester in 1914. An AGM was held each year and things were moving well until war broke out in 1914. After the First World War, Arthur Grundy was responsible for setting the Federation in motion again. Not only did he perform the duties of both Chairman and Secretary, but he organised the first Federation Festival to be held after the war - at Canterbury in 1920. In 1925 Harold Cattley (Chester) took up the office of Hon. Secretary and was involved in organising the Festivals from 1925-31. Festivals (incorporating the AGM) took place every year from 1920 until 1938 (with the exception of 1923 and 1924), but again things were interrupted by the outbreak of WW2. After the Second World War it was Frank Hewitt (Chester) as Hon. Secretary 1931-75 who got the Federation moving again. He worked extremely hard and under his aegis membership grew to 38 associations. Frank, however, ran things very much his own way, since he was, in effect, his own Chairman - the position of chairman was mainly nominal, being filled each year by the Dean of the Cathedral who was hosting the Festival; the host Bishop was President. This was changed in 1953 when George Tarbutt (Westminster Abbey) became Chairman, and the Dean of the host Cathedral was made President for the year, an arrangement that is still in place today. George Tarbutt was instrumental in giving the Federation new direction and laid the foundation for Canon Gordon Berriman (Durham) to become Chairman in 1957, an office he held, with great distinction, until 1977. 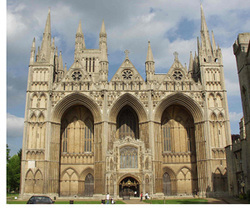 It was during his Chairmanship that the Federation protested strongly to the BBC, when they threatened to cut the broadcasts of Choral Evensong on Wednesday. We like to think that the Federation's efforts did something to bring about a happy outcome. When Gordon retired, the position of Hon. Chaplain was created for him to continue an active role in the Federation, a position he continued to hold until his sudden death on Christmas Day 1981. It would appear that the position of Hon. Chaplain died with him, as it has never been filled since. During the period 1978-80 events turned a complete circle; the Chairman elected was Sydney Skinner, again from York, and the Hon. Secretary was Cyril Laxton, again from Peterborough (as in 1910). These two worked extremely hard for the Federation which continued to flourish and now had 49 affiliated associations. Together Sydney and Cyril kept an eye on the national scene. For example; if the 1976 Education Act had been adopted in its entirety, it would have spelled the end of Cathedral Choir Schools. Led by Chairman, Sydney Skinner, the Federation fought this issue with all its strength. Protest letters were sent to Government Ministers and M.Ps, outlining the essential position which a choir holds in the life of a Cathedral and emphasising the great choral tradition in the British Isles that went back nearly 1000 years and was the envy of our American and Continental friends. Many letters were received from M.Ps who were serving on the Standing Committee dealing with this matter, thanking the Federation for their help and information. In 1980 Cyril Laxton (Peterborough) was elected Chairman and John Bowdler (Gloucester) became Hon. Secretary. These two officers worked tirelessly and gathered a wealth of knowledge between them on Federation matters which has been invaluable to succeeding officers. In 1982 John Phillips (Worcester) became Chairman. John was a talented musician and adjudicator, he was also a good chairman and worked hard to strengthen the Federation. Frank Thomas (Edinburgh St Mary's) took over the Chairmanship in 1987 to 1990. Frank was a dedicated chairman and made many visits to Associations during his short term in office. The 1990s saw many changes, especially on the Executive Committee with John Holt (Wakefield) elected Chairman, Stan Packman (Wakefield/Exeter) Hon. Secretary and David Horwood (Eton College) taking over as Hon. Treasurer from David Frost (Derby). Under the leadership of John Holt the Federation was streamlined and took on a more modern approach. Rules were updated, yearly financial statements presented and minutes and administration were computerised, making the Federation well placed for the new Millennium. In 1992 Geoffrey Mitchell (Exeter) became Chairman. Geoffrey continued the modern approach, visited many associations, added further association badges to the Chairman's Chain of Office and was instrumental in arranging and 'guiding' successful foreign tours for the Federation. In 1995 Basil Saville (St Albans) took over as Hon. Secretary, with Robert Woodcock (Norwich) as Asst. Hon. Secretary. A Membership Card system was launched in 1993, and to date well over 2500 had been issued. A Federation Shop was opened in the same year selling sweatshirts and pens and now has a wide selection of stock available at Federation events and by mail order (see Merchandise page). In 1998 a new post was created on the Executive Committee of Marketing Officer. David Horner (York) took on this position after relinquishing the editorship of the Once-A-Chorister magazine, which he had published for ten years. With the office of Chairman now limited to five years, 1997 saw Dennis Townhill (Lincoln and Edinburgh) elected to take over from Geoffrey. During his tenure, Dennis has visited many associations and also wrote a book entitled 'The Imp and the Thistle' - the story of his life of music-making, from chorister in Lincoln to Organist Emeritus of St. Mary’s Cathedral Edinburgh. Dennis very generously donated the proceeds from the sale of this book to the Federation. In 2001 Andrew Orland (Lincoln) was elected Secretary, probably being the youngest person to hold this office in the Federations history. The following year, Alan Oyston (Durham) took over as Chairman. Alan had a gift for being able to say just the right thing at any occasion, be it a quick thank you to a Dean or host Association, or a full blown speech at a Festival Banquet. During this time the Federation moved into the new century with computers and a web site. 2007 saw Gordon Hughes (Christchurch Oxford) elected Chairman followed by Ian Henderson (Rochester) in 2010.